Lovely to see Forlan Honey Rhythm at The Three Counties as always Gabby has her looking superb. Getting warm after judging the Premium Stallions at the show. I was looking forward to attending the Glamorgan WPCA last night and as 1 entered the village hall at Pontyclun memories flooded back and so many people I knew , over 40 years ago a posse of members travelled from over the bridge which included myself, Brian, George & Peggy, Ableton Stud, Sheila Johnsey the Wilcrick stud and Frank and Jean of the Vimpenny stud accompanied by our children to have an evening of fun and laughter, it would have been good that time …could have stood still but many of us had lost friends and family members but there were four golden oldies collectively over 333 years, Jean Pritchard, myself , Wynne and Ruth Davies’s. I was there to talk about my year as president and after an excellent Christmas meal, hope that all present enjoyed my talk. Afterwards some games, photos and lots of catching up. I had been asked by Jean Pritchard to stay for the night and arriving at her home we sat and chatted about our many memories and enjoyed a cup of chocolate with a top up of alcohol, after a good night’s sleep I headed for home arriving at 12noon. Thank you to everyone who attended and made my evening. Driving down to Exeter I passed where the Avon & Borders WPCA held a show many years ago AND Forlan Sugar was Champion, judge Rosemary Phillipson Stowe. 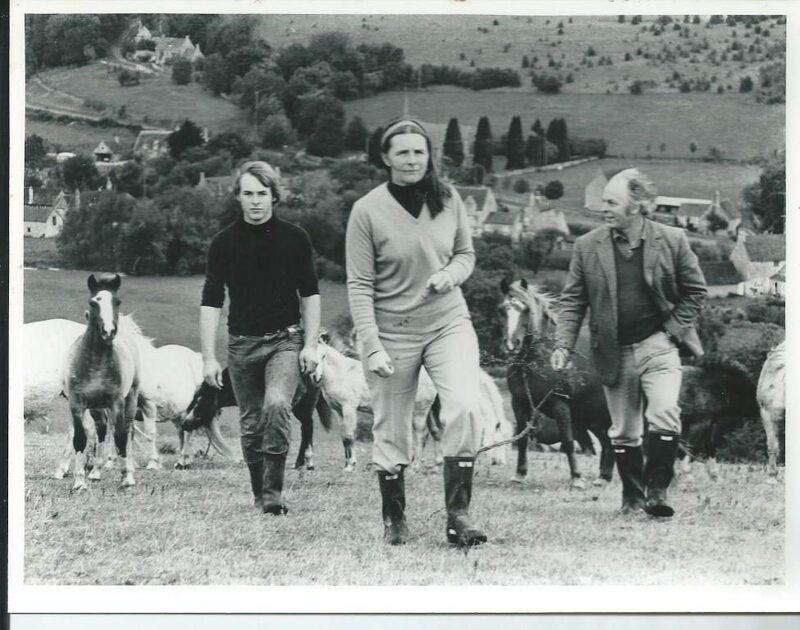 I don’t think that many people knew that at one time I owned four mares by Madog, when I started showing inhand, it was difficult to get close in the line up with the Coed Coch ponies nearly always winning the top prizes so if you can’t beat them join them, so our quest for Madog mares began in the early 70s, we saw a beautiful mare called Littleworth Sunset at Fayre Oakes, she did not sell but 2 months later she was ours having bought her from the Bengad Stud, her dam was Cilrhedyn Nancy, she was the only Madog mare of the four that clicked with Revel Torc, she did not have a good beginning in her first few months at Forlan, we had a horrendous tornado sweep up through the box valley over our farm towards Grittleton and further, the noise was horrific and the ponies were screaming in terror, trees were uprooted, holes so deep that car could have been lost in them and we found Sunset in the woods, she seemed okay, a little lame but slowly we made our way to the stables and settled her for the night, to our horror next morning we found her with her near hind leg hanging, a vet arrived and said she had a serious break and it was best to put her to sleep, I said I wanted another opinion and the next vet said it was 50-50 but he would plaster her and she would have to have most of her weight taken of her legs with a sling, she was a good patient and about few weeks later he had to change her plaster he said that if she so much as flicked her leg as he removed the plaster (with a saw) nothing could be done, well this little mare stood absolutely still as one plaster was removed and another put in place. Littleworth Sunset was surrounded by four people, the vet using the saw and another vet, Brian & myself, she stood on her three legs as the fourth was held in a firm grip, plaster off, plaster on and she did not move, what a star, during the weeks previous we wondered how her leg was broken just above the fetlock and came to the conclusion that it had been fractured in the woodlands and it was only when she laid down during the night in the stable and the getting up had the leg fully cracked . Sunset continued to make progress the sling was lowered gradually so that more and more weight was put on her leg. 10 weeks later the plaster came off and she was using her leg. For several weeks she was led out each walk going a longer distance and then she was allowed to walk on her own in a very small paddock, but the day came when we had to let her have her freedom, in a paddock of two acres we released her and our hearts were in our mouths as she took off at a gallop towards the woods, had a little buck and then galloped back to us The vet said that in her later years she would have arthritis in that leg but she did not, she lived until she was 27 years, never sick or sorry, ruled the roost with the other mares a flick of her ears told them to behave, always browsing the hedgerows rather than grazing, I remember the day we walked out onto the hill and she looked at me it was almost to say my time has come, she was PTS on the farm and buried under an oak tree. Left for Builth Wales at 12.15pm arriving at 3.30pm after some hold ups. The International Meeting began at 4pm. A wonderful turnout of council members & International members, to name but a few Australia, South Africa, America, Belgium, France, Sweden, Holland, Ireland and more. Afterwards we all made our way to the Pavilion which has been refurbished where cameras were ready to roll for Welsh TV, after an excellent introduction from our Chairman John Kirk thanking those that had made this refurbishment possible it was time for me to cut the tape. It was lovely to have a good turnout from our members and we all enjoyed some bubbly to celebrate, I hope those who were not at the show enjoyed the TV footage. Time for me to find my way to Dukeshill and my excellent hosts Kathy & Jo Shiels. After a very enjoyable dinner time to retire as a very busy four days to follow. Did someone say an easy day, morning feeds, three stables cleaned out, snatched a sandwich and then driven to Westbury to collect my horsebox, repairs very good and then back home sounds, silly but I love my Renault Master. Prepared the horsebox for my trip to Three Counties tomorrow and no I don’t have the wrong day, Forlan Honey bunch and Honey Chocolate Chip are on show in a native breeds area, so anyone there please come and say hello. Haltered Chocolate Chip and handled him first time ever, washed his dams white socks and tail she was very accommodating. Tomato soup and another sandwich, evening stables, then everything ready to leave at 5.45am tomorrow and so to bed.. Photo Forlan Miss Sunshine 3 years. Up at 5am, drove to Chippenham and then caught the National Express to London just £11 return, arriving at Victoria Coach Station hailed a taxi to St James Park then a fairly long walk to my allotted gate, by this time raining heavily. After passing very strict security, was given a goody bag and then handed a what I thought was PG Tips, just opened it at home and it is a beautiful cup & saucer, then collected my hamper the contents were impressive and gluten free. We were handed ponchos and in the end I wore it otherwise would have been soaked through. The first parade was then underway, it started to dry up and then Duke & Duchess of Cambridge & Prince Harry walked all the way down The Mall. Wow Prince Harry shook my hand saw my chain of office read out loud The Welsh Pony & Cob Society and said so you are Madam President. What a moment. Then The Queen and Prince Phillip were driven slowly down The Mall to tumultuous cheering. Yesterday sat nav died and as I was driving up close to Stanstead that evening rushed into Chippenham to buy a new one, fantastic so easy, no hitches and so arrived at Holiday Inn for the night, enjoyed a meal with the other judges and talked of our experiences, sublime to the ridiculous over our years of judging. I had a very comfortable night and after breakfast at 7.30am left for the Eastern WPCA Show only 10 minutes down the road. 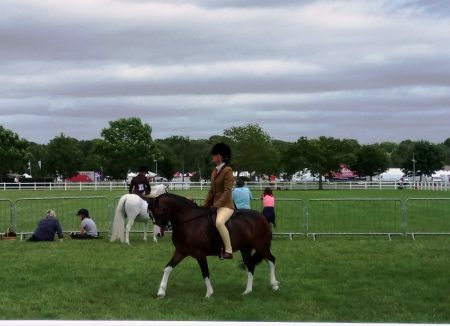 After judging two ridden classes, small classes but lovely ponies I relaxed for the rest of the day until I judged The Supreme In-hand. Thank you to the judges who judged the five sections as beautiful champion ponies & cobs came before me, in my eyes on the day there was an outstanding section “D” Cob and section “B” filly, in that order they were placed supreme youngstock champions and then no change they were Supreme & Reserve Supreme of the Show. Sorry I don’t know the name of the Supreme but know that Reserve Supreme Champion was a Thistledown pony, I am sure someone will soon post who they were. I would like to mention the people who brought their cobs forward at the end of very long day for The Young Judges Competition; I had two really competent young judges who will now go forward to the Young Judges competition at National Welsh Championship Show in August. 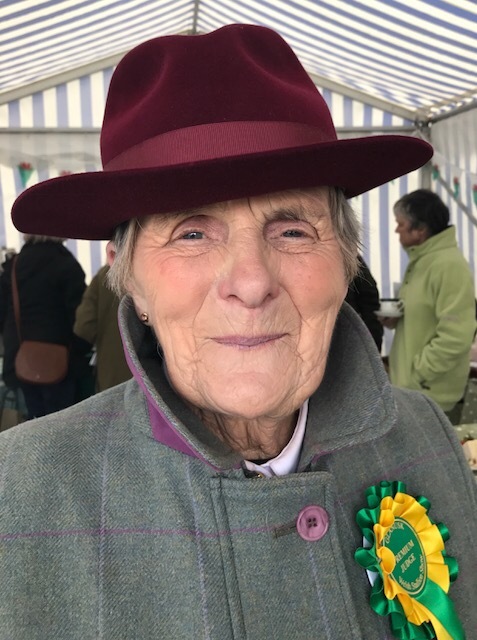 I would like to add that my busy years as President Elect & as President could only be possible because of Molly who looks after the home, dogs, bottle fed lambs and any ponies that receive hard feed and to Burt who keeps an eye open all around the farm, I cannot thanks them enough. Also Forlan Honey Rhythm & Forlan Honey Buzzard were very successful today in-hand & ridden.